Please see the description of the GeoShade product that calculates shade patterns for trees within a landscape. Also see the description of the Land Design Evolver product that helps design crop plantings over time in 3 dimensional space. Ken Bunzel has a background designing, installing, and maintaining landscapes and has the knowledge required to design software for this field. Sacramento Water, The Sanborn Map Company, Inc. This application, called H2Observe, focuses on irrigated landscape and water usage. The application uses a land cover GIS layer to depict irrigated landscape. The layer is overlaid with a City parcels layer to provide a basis for predicting landscape water usage for each parcel. The information is compared with actual monthly water usage records and weather data to identify customers who could be saving money and water through water conservation efforts. The application is built in COM, using Visual Basic and ArcObjects to produce an ArcMap extension and toolbar. Kingbird Software provided software development services for this project. StrataPoint Grounds Management, Space Imaging, Inc.
StrataPoint, Inc. contracted with Space Imaging to create a grounds management application for golf courses and municipalities. This application focuses on landscape management, especially management of trees and turf. 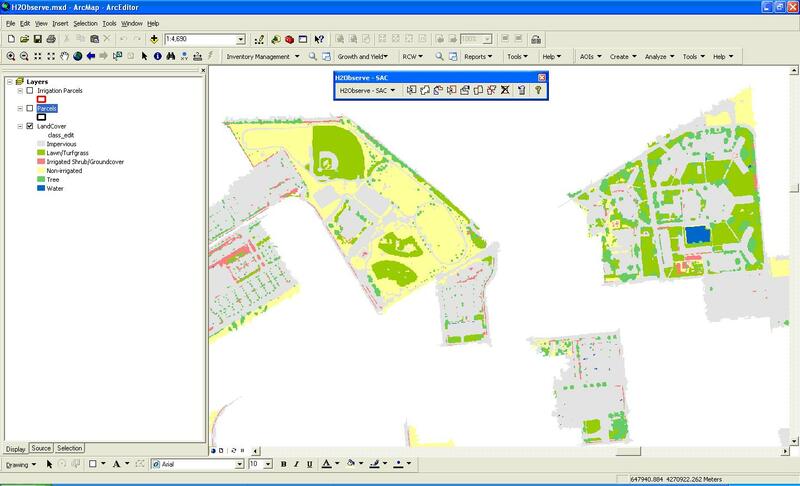 A module calculates and displays tree shade in a GIS format. The application is built using MapObjects with Visual Basic. Ken Bunzel provided software development services while employed with Space Imaging, Inc.
Santa Rosa Water, Space Imaging, Inc.
With funding from NASA, the City of Santa Rosa contracted with Space Imaging, Inc. to build a prototype application that focuses on irrigated landscape and water usage. The application uses a land cover GIS layer, derived from IKONOS satellite imagery, to depict irrigated landscape. The layer is overlaid with a City parcels layer to provide a basis for predicting landscape water usage for each parcel. The information is compared with actual water usage records to identify customers who could be saving money through water conservation. The application is built in COM, using Visual Basic with ArcObjects, and is fully integrated with ArcMap. Ken Bunzel provided software development services while employed with Space Imaging, Inc.